Unit Footprint, In Use 18.5"
The AmeriGlide AC Cargo Lift is a great addition to any storage room, warehouse, manufacturing plant, or other commercial building. 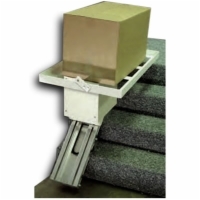 This strong and sturdy cargo lift is designed to be installed on an existing staircase and is rated for transporting 350 pound loads. You can customize the track length to fit your staircase and enjoy the security of limit switches that will automatically stop the lift when it reaches the top or bottom of the stairs. 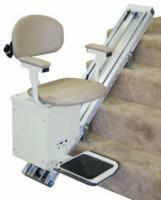 (If the track length is 16 feet or longer, the weight capacity is reduced to 250 pounds.) This model runs off of a 115 VAC household current, so all you have to do is plug it into an existing electrical outlet. No major renovations required. When not in use, the space saving platform folds up and out of the way. Call us today to learn more about this durable and reliable American made product that will do all the heavy lifting for you and make your workplace safer and more efficient! Head Brewer from Minneapolis/ Bar application would recommend this to a friend. Easy install, quick and quiet cargo transporter. The Cargo lift says it's rated at 350lbs but it's labeled on the motor housing as 300lbs. You must balance cargo over motor housing (cargo basket flexes easily). Must hold button to operate lift does not lock in operating position. Nice product. Very fast and easy shipping. Will it hold up for years for keg transport?